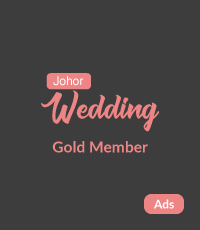 Get certified with JohorWedding.com Gold Member. Your listing will be featured and you're able to purchase our featured advertisement banner. Noted Gold Member are limited supply, kindly contact our support for more information. We sell wedding accessories, photography & videography vouchers and others services related to wedding. You're welcomed to sell your wedding goods or wedding service vouchers in our platform. Kindly contact us for more details. Our support team are ready to assist our user to planning their wedding. We promise to reply wedding planning request in 2 working days. If you are annoying for too many vendors to choose, you may tell us your requirement, we will mix and match for you. Get more sales let more Johorean bridal & groom know your brand !